Overlooking Marine Terrace, this successful licensed vacation rental, offers wonderful ocean views and beautiful sunsets in a sprawling floor plan perfect for entertaining. 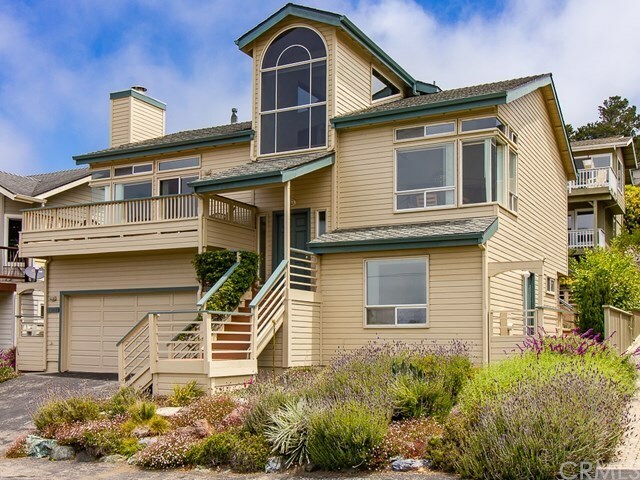 With vaulted wood ceilings and large picture windows, the living space is bright and open, and includes a spacious formal dining room, living room with fireplace and ocean view deck, kitchen with garden window and separate breakfast nook with deck. The ocean view loft, with rear deck, makes for a great reading space, game area, or home office. The master suite has a walk-in closet, ocean views, and bath featuring double sinks, separate soaking tub and large shower. There is an inside laundry room and fully finished two-car garage. The backyard features a gas fire pit, decks, and gardens for outdoor enjoyment. This home is also just a short walk to the beach access and Fiscalini Ranch Preserve! Directions: Highway 1, take Ardath Drive west to the end, turn right on Marlborough Lane, home is about one block up on the right.